I couldn't pronounce Chefchaouen, so I kept calling it the "Blue City." 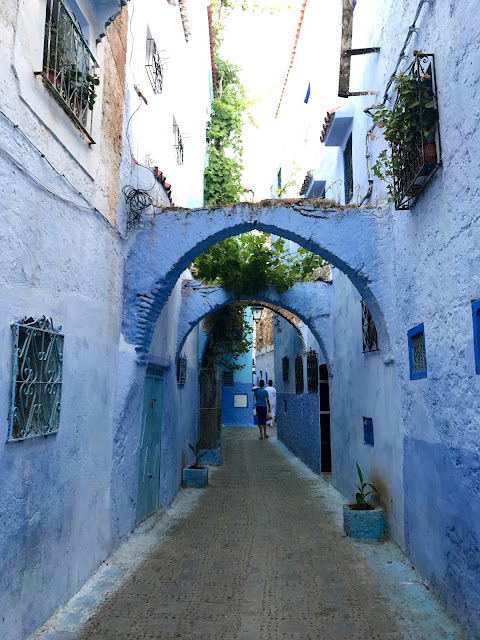 The Blue City is the only place I cannot compromise on this trip to Morocco, I said. I want to go to there, I demanded. When I woke up on that long bus ride from Fez to Chefchaouen, the first thing I saw was the shiny white city tucked into the beige and brown hillside. I was only mildly disappointed that it wasn't just a royal blue blur from afar, but I'm unreasonable and I overestimate the intensity of colors sometimes. The first thing I did was sweat profusely over my little lunch. The epitome of my travel eating is this almost-hunter-almost-gatherer habit of hoarding free food where I can get it. 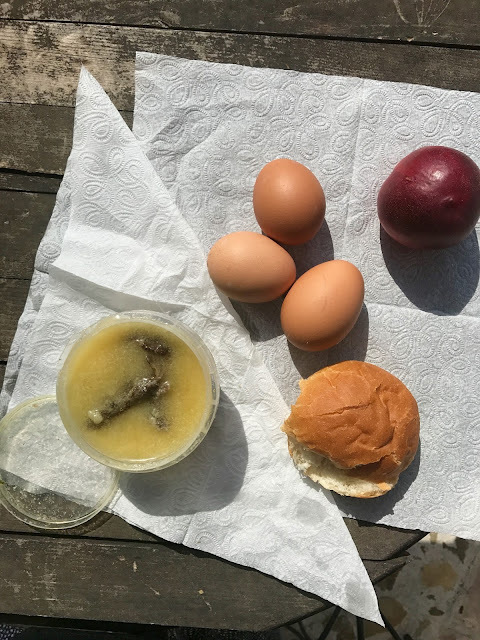 So with some hard boiled eggs from hotel breakfast, a plum from another hotel breakfast, individually packaged rolls from the airplane, and khlii from the market in Meknes, I put together a mini picnic. To have with a beautiful view. I had khlii at the top of my list after watching Zimmern's Morocco episode. 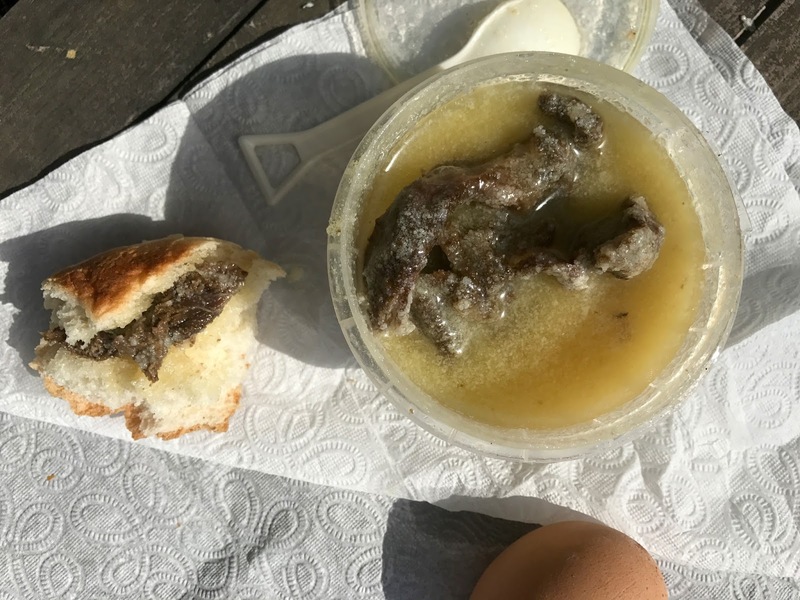 Salted and dried preserved meat packed in oil and animal fat. Usually served with scrambled eggs for breakfast. This is everything I want... and couldn't have because we never had access to a kitchen. So I fished my meat out of the fat broth and made sandwiches. Still satisfying. We took an evening walk through all the blue before dinner, where I was unsatisfied with every picture I took. And saw lots more cats in the alleys and doorways. So quick and easy intermission over - let's go back to food. The first night, we had dinner at the hotel in the dark. 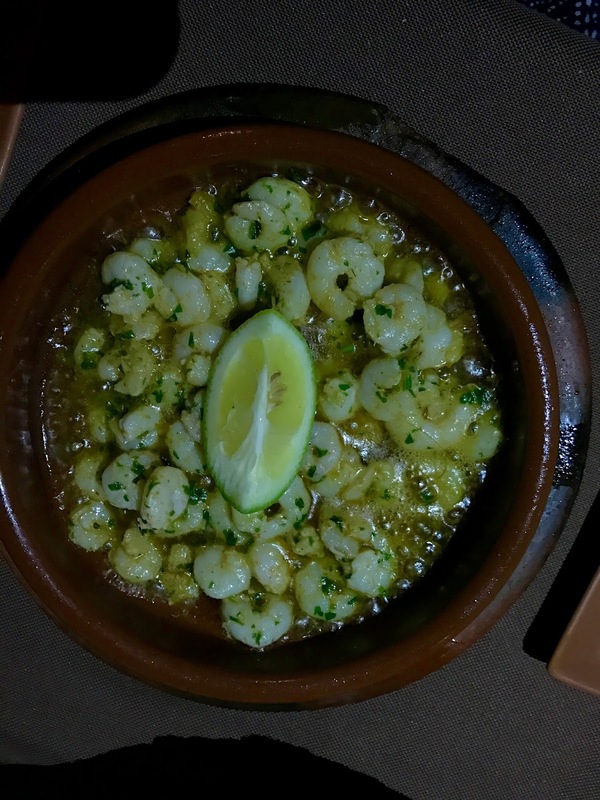 And that's why my shrimp tagine looks neon green-yellow. Cell phone flashlight lighting isn't great. Finally having seafood (drowned in buttery and fragrant sauce) was great. Even if it was the size of shrimp I'd feed to other shrimp. Had to sneak some of my dad's third beef tagine with prunes, almonds, and hard boiled eggs, which was the most reliable order of the trip thus far. 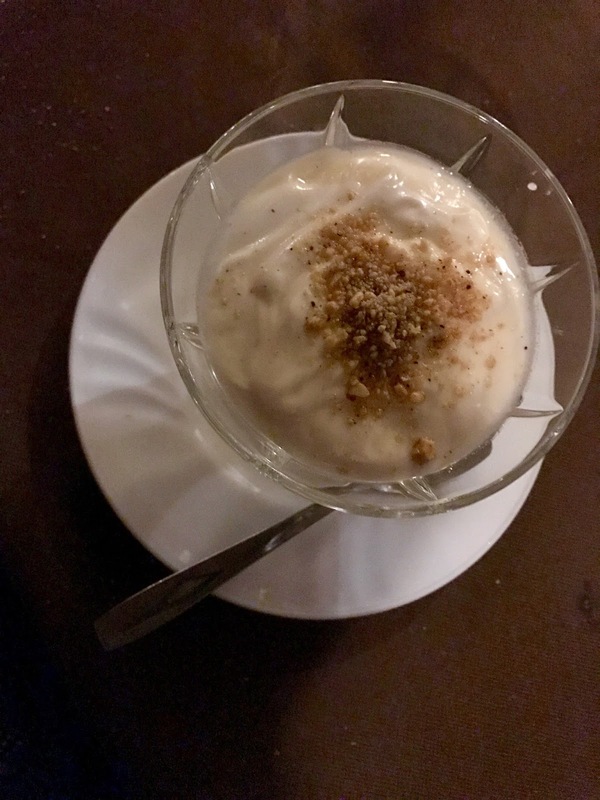 And then because Audrey can only digest dairy products from goats, we definitely had to try goat's yogurt for dessert. Apparently Chefchaouen is known for their goat cheese. 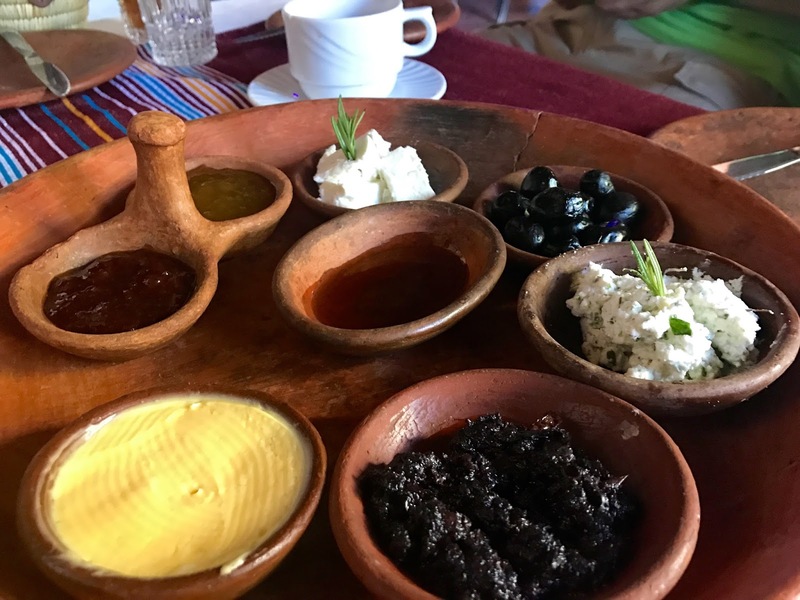 Which made the hotel breakfast the best breakfast I had in Morocco. On this limited tour group situation. I mean, I think I would've been most happy with this breakfast regardless of other options. And it just looks pretty in these clay dishes. A solid pool of butter, jams, honey, whole olives and a tapenade-like spread, whole blocks of goat cheese and herbed goat cheese. Fresh orange juice and those layered semolina crepes to shuttle the spreads and cheese into my mouth. Then we went for basically the same walk through all the blue... but by sunlight. And you'd be so surprised to know everything was way more vibrant and way more blue in the sun than in the... night time. They had just repainted a lot of the sections for Ramadan, so everything felt so fresh and new. We bought some colorful carpets and got a super relaxing hammam (I get so disgusting when I sweat, by the way) and were unsuccessful in finding goat milk ice cream. Almost unsuccessful in finding a non tourist-y restaurant for dinner because Issmail told us there would be a little chef figure by the door. We literally passed the correct place a couple times before we asked the man who sold us a couple cans of juice. "Over there," he said, pointing to the establishment right next door. Hey, turns out it's super difficult to translate sounds to text when you don't understand a foreign language... we were depending heavily on finding a little man in a chef's hat (it was actually a little man in a fez hat). Oh, but that wasn't the misunderstanding we thought we misunderstood. Issmail did indeed say "chef," but we just didn't recognize the name on the restaurant on the sign. But we figured it out. We found it! 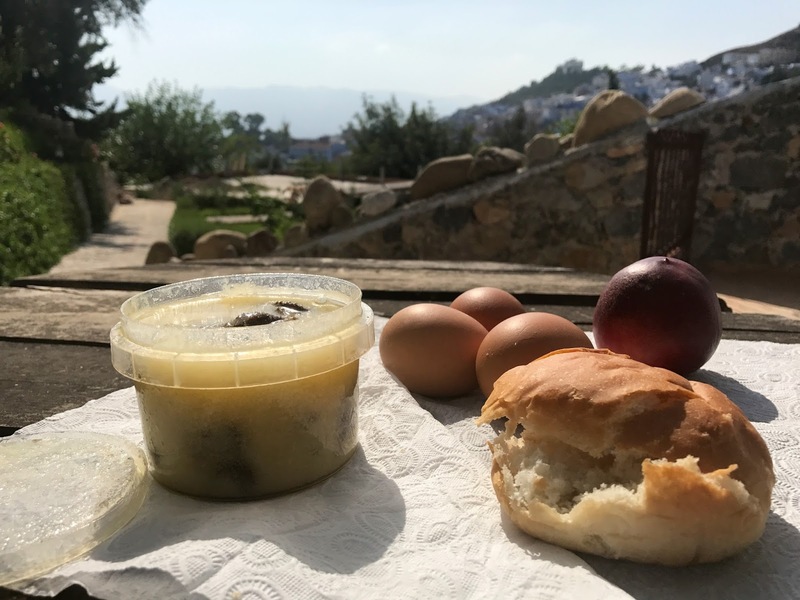 We climbed all the way to the top to munch on olives and bread while contemplating the kasbah. We were high enough up to watch them set up a stage within the kasbah walls. We got a Moroccan salad for the goat cheese. And did not get food poisoning from eating raw veg, in case you were wondering. I was incredibly appreciative of the crunchy and refreshing greens after many days of cous cous. 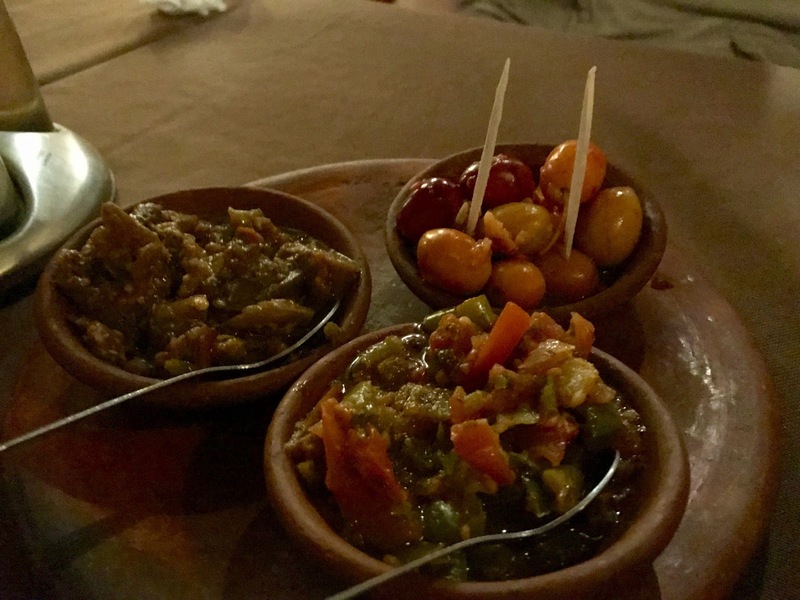 They were out of rabbit tagine (boooooo, I don't think I'm over it), so I got the reliable beef and prune tagine, which ended up being not-so-reliable. It was tough. I'm definitely not over the rabbit tagine. But man was the view awesome.